We all know how hard MS Paint is to use. Drawing on a computer can't match the ease and accuracy of moving around a pencil on paper in real life. A mouse or trackpad is far too cumbersome to maneuver, making even a stick figure hard to look good. But what if there was a way to map actual pencil strokes onto the computer so that you could still draw naturally AND have your creation on your screen? This is why we made Back to the Drawing Board!, a simple way to use a pen or pencil and draw on actual paper which translates your drawing on to a screen. Back to the Drawing Board! works by having two potentiometers that change voltage when pulled on. These voltages from the potentiometers are mapped to x and y coordinates on a canvas that draw the image. The setup for the string potentiometer was created from scratch by us. The user first sets up the apparatus by placing a paper on the drawing board and then inserting a pencil into the washer. 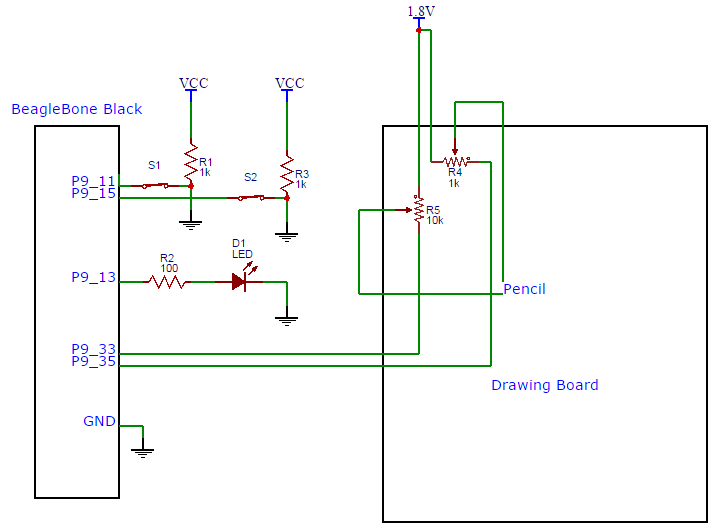 Next, the user presses and holds the draw button the breadboard to activate the draw function. This allows for the user to move the pencil continuously and draw whatever curves they wish. To stop drawing, just release the button and move the pencil to the next desired location. There is also a button to toggle through various colors to create more vibrant works of art. We utilized processing.js library to handle graphical functions like draw() and used BoneScript library to read the voltages from the BeagleBone. This file contains the logic for getting values for the pot and displaying it on the screen. Bonescript and Processing are required for it to run with the BBB.